Call it what you will … but millions of people suffer from a lack of energy daily. That energy loss can be chalked up to a variety of factors – nutrition, fitness, illness, stress, etc. But there’s one underlying cause of energy loss that has gotten a lot of publicity in recent years … the high levels of toxicity in the body. And research has proven this to be true. Our bodies naturally fight these toxins ever day. But its ability to effectively fight them has been sabotaged due to our bodies’ natural aging process, external toxins, poor diet, and other factors. Glutathione is one of the key tripeptides that helps the body detoxify itself. The only problem is that your body is in short supply of it. Therefore, you must replenish what’s missing. That’s where glutathione supplements come into play. Today, we’ll take an in-depth look at NOW Foods Glutathione Plus, and see if it’s a plausible option for meeting your daily glutathione needs. What is NOW Foods Glutathione 500mg Plus? Glutathione is also one of the major keys to a healthy immune system and helps prevent oxidative stress in your body’s cells while simultaneously neutralizing free radicals that could do severe long-term damage to your body. But as we touched on earlier, your body’s natural production of glutathione is very sensitive to outside factors (and not in a good way). NOW Foods Glutathione Plus helps balance out your body’s glutathione deficiency by providing your body with its daily requirement of reduced glutathione. In other words, it gives your body everything it needs to detoxify itself naturally – resulting in more energy, less stress, and healthier skin, to name a few. Your body produces two forms of glutathione – the oxidized kind and non-oxidized kind (called reduced glutathione). Any cell with approximately 90% reduced glutathione and 10% oxidized glutathione is considered to be a healthy cell. However, in many people the percentages are virtually reversed. So by supplementing your body with an extra 500mg of reduced glutathione, you’re allowing your cells the ability to reach the required percentages and protect and repair themselves. And healthier cells mean a much healthier body. Milk Thistle extract is a natural herb that has been shown to help boost natural glutathione levels in the body. It has also been linked with the growth of new cells in the liver. As such, it complements reduced glutathione very well. Alpha-lipoic acid is very similar in function to glutathione. It is directly involved in your body’s production of energy, blood sugar control, and detoxification. Unfortunately, it also shares glutathione’s extreme sensitivity to outside influences. 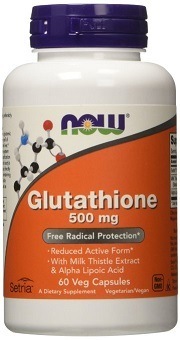 The 50mg in NOW Foods Glutathione 500mg Plus essentially eliminates your body’s alpha lipoic acid deficiency. Honestly, there’s not much to dislike about this one. And it’s even harder to find negative criticism about it. There were a couple of consumers that complained of having an upset stomach as a result of taking this supplement. However, that’s a possible side effect in most glutathione products. NOW Foods went the extra mile when they decided to add these two ingredients to their glutathione supplement. All three together compliment each other very well – essentially making the supplement all the more powerful. There have been quite a few consumers that have bragged about NOW Foods Glutathione Plus’ effectiveness at lightening their skin (dark spots, age spots, etc.) and giving it a “luminous glow.” But remember, patience is key. One consumer had taken the supplement for two years before achieving the results they desired.